I don’t really recall the first time I read about the Banyan tree, but it was definately in a novel. And definately I understood it had absolutely nothing to do with bananas…. I got the feeling the tree had some significance, and that it was big! The first time I actually saw one, was in Pune some years back. My friends Girish, Sanjay and Mandar took me to the University of Pune, and I asked them to look one up for me, in the huge surrounding garden. The Banyan tree (Ficus bengalensis) is sacred to the Hindus and is often found near temples. It is extremely long-lived, one of the the oldest one – of 400 years – can be found in Kolkata Botanical Gardens. Yes, it’s big and not at all attractive in the sense of elegance…, but the aerial roots that decends to the ground from the branches gives it a fairy tale look and also a very distinct look. I often come across the Banyan tree in novels, very often described as big, and yes, it often grows to a phenomenal size. I’m always on the look out for a Banyan, the first Indian tree I got to know. 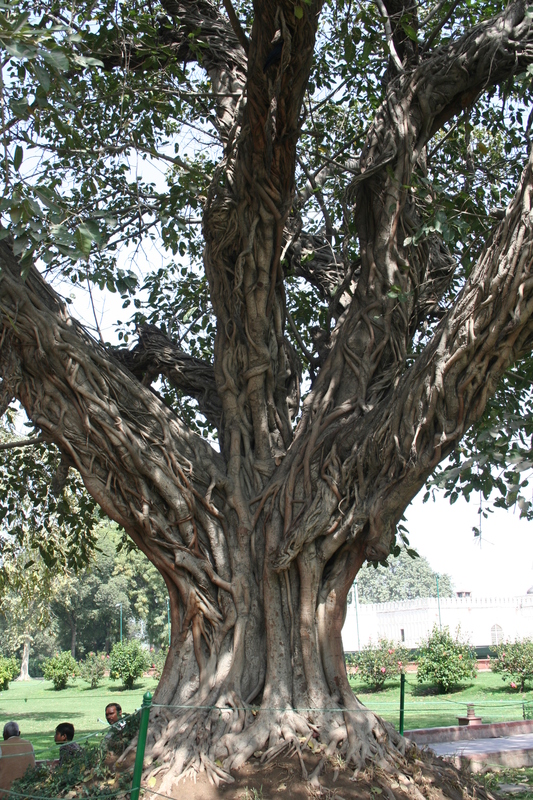 A Banyan tree in the surrounding gardens of The Red Fort in Delhi. Another tree which I have come across in many novels, is the Neem (Azadirachta indica). Its more elegant than the Banyan and very popular because of its medical value. Neem twigs can be used as a tootbrush, where plastic yet has not enveloped the society. 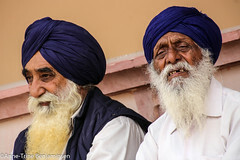 This is something often referred to in Indian novels, used mostly among poor people. 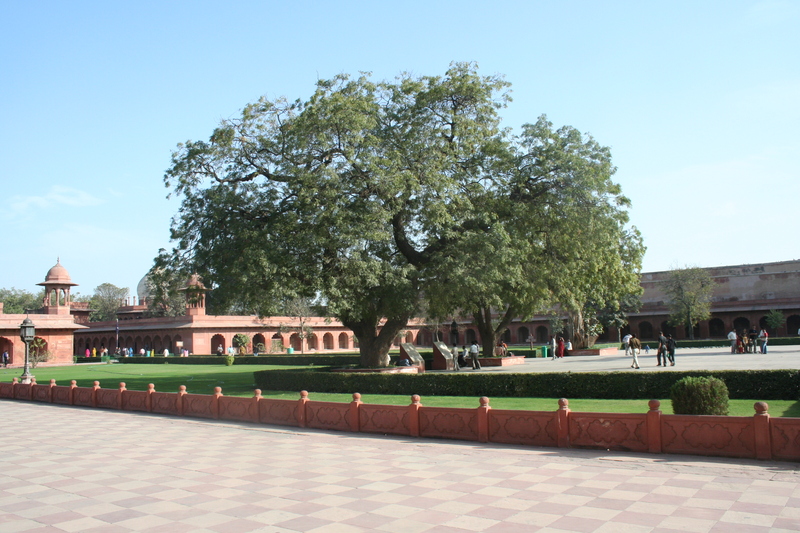 The first time I really saw a Neem was outside the gates of Taj Mahal in Agra. The Taj Mahal was grand and beautiful, but it takes some effort to visit one of the world’s seven wonders…and thus it was a bit of a relief when we escaped the guide….and my eyes fell on the big and beautiful tree that stood majestetically in the middle of a square. A beautiful Neem. A Neem outside the gates of the Taj Mahal in Agra. I fell in love with the banyan the moment I saw it, but it is quite possible to fall in love with the name of a tree….. The first time I read about the Gulmohar (Delonix regia), it was the name itself that caught my attention. Gulmohar or Gul mohur as I have also seen it written. 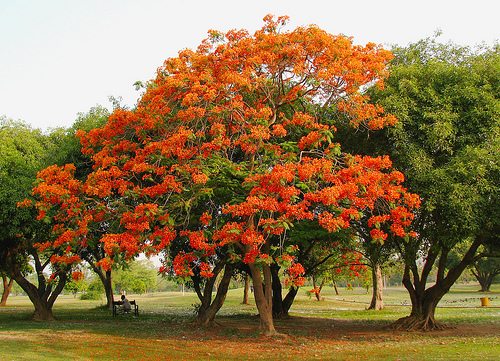 Gulmohar is the name of a character in The Peacock Throne by Sujit Saraf. She is one of the whores on GB Road in Delhi. “It’s a flower, the bai said to her. It will make people swoon over you to catch the whiff of your fragrance“. Gulmohar comes from Nepal, snatched away from her hometown by her uncle Jangbahadur to serve as a whore in Delhi at the age of 16… The book is a terrific read, set in old Delhi and its main thoroughfare Chandni Chowk. Somehow I associated the name Gulmohar with yellow… I envisaged a tree with yellow flowers. Obviously because “gul” in Norwegian means yellow. The tree has in fact beautiful orange/red/vermillion flowers. Its flowering season in India is April – June, a time of the year of which I don’t go to India. But my great wish is to see one, in full bloom! And for sure I will think of poor Gulmohar in GB Road! Google helped me find this beautiful specimen! I love trees.In all forms and shapes . specially if they are large and blooming…ur pics are really nice and real.. while looking to the tree pics it was like as if i am standing there..seeing them..that orange Gulmohar one ..my fav. if u can find then try tolook at AMALTAAS in its bloom..Its like brightest yellow Chandeliers dangling from the green canopy….Be..autiful….to me it sometimes looks like bunches of gold ‘Asharfis’.